Is it a normal season this year for tropical cyclones in the Western North Pacific? The Western North Pacific (WNP) is the most active area for tropical cyclones (TCs). The number of TCs occurred in the WNP so far (end of October) this year is 26 – just the average number of annual TCs over 1980-2017 (Figure 1 upper). As TC season in the north Hemisphere usually finishes up in October, we thus might think we are having another normal or slightly above-normal TC season for TC occurrence in the WNP. Figure 1: Top: Western North Pacific (WNP) (0-60°N, 100-180°E) tropical cyclone (TC) count during the period 1980-2018. The 2018 TC record is updated to 31st October. 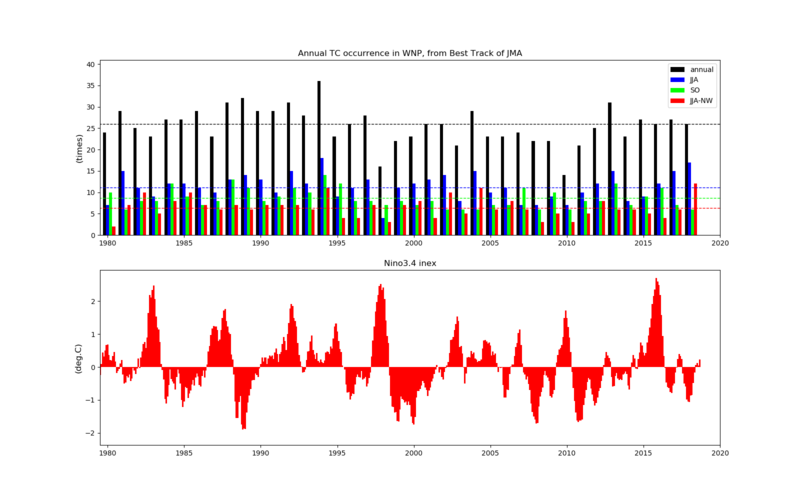 Black, blue and green bars show annual, early summer (June-August, JJA) and late summer (September-October, SO) TC counts, respectively, while red bar is for the number of TCs that occur just in the northwestern sector (20-40°N, 120-140°E) of the WNP. Dashed lines are the long-term averages over 1980-2017. Bottom: Monthly Nino3.4 index anomaly during 1980-2018. Nino3.4 is the average sea surface temperature anomaly in the region of 5°N-5°S, 170°-120°W. Data sources: TC data are the Best Track observational TC record, retrieved on the 5th October 2018, from the Japan Meteorological Agency. Nino3.4 is obtained from NOAA PSD , retrieved on the 5th November 2018. But, statistics from observations show a few interesting points that make this year not normal for TC activities(Only the TCs of tropical storm intensity or greater are considered here, i.e. maximum sustained wind speed ≥ O34 knots). First, it’s an active early summer (June-August, JJA) for TCs in the WNP (Figure 1 upper). In JJA, the long-term average number of named TCs over this area during 1980-2017 is 11, whilst the past early summer saw 17 tropical storms being named, 6 above the average, making it the second largest (it’s just 1 TC less than in 1994) on record since 1980. Second, it then turned into a quiescent late summer (September-October) for TC occurrence. Late summer is usually a busy period when strong TCs (e.g. super typhoons) occur. The average number of TCs occurred during late summer is 8. There were only 6 TCs declared in the past late summer. More interestingly, the past October was very quiet in the WNP, featured with only one TC (Typhoon Yutu, formed on 21st October) declared. So far, it seems that some TCs, which were supposed to occur in a later time, were formed in an earlier time, making it a very busy early summer. Figure 2: TC occurrence anomaly (with long-term average removed) in JJA for each year in the Western North Pacific. Bottom right shows the average of TC occurrence in JJA over 1980-2018. Third, at regional scale (Figure 2), we see the past early summer is actually an extremely busy period for TCs especially in the northwestern parts (20-40°N, 120-140°E). The climatology of the number of TCs passing through this region in early summer is 6 (also see Figure 1 upper). But, there were 12 TCs coming through this region in JJA this year, double the average number. In relation to the normal path of TCs, e.g. through the Philippine Sea and Taiwan (Figure 2 bottom right), this year’s TCs tend to shift northward heading to the north of China and the west of Japan. Similar path years are 1994, 2002 and 2004, but they have smaller positive anomalies. 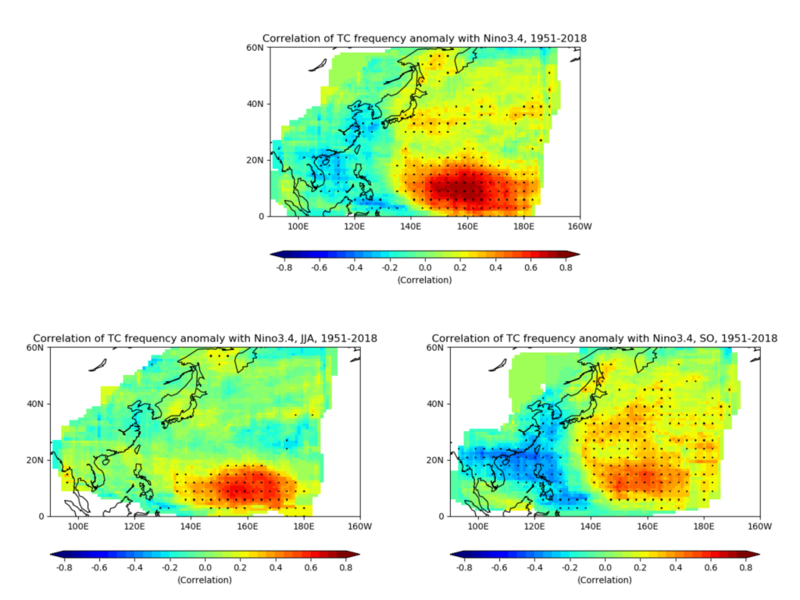 Figure 3: Correlations between JMA observed TC occurrence anomaly and Nino3.4 index, for annual values (top), early summer (June-August, JJA) values (bottom left) and late summer (September-October, SO) values (bottom right), over 1951-2018. Dot areas are where the correlations pass the 0.1 significance test (90% confidence level). It has been well documented that the El Niño–Southern Oscillation (ENSO) plays an important role in the inter-annual variability of TC activity (especially for the TC lifetime) via modulating the large-scale atmospheric environments (e.g. wind shear and relative humidity). As the effect on number of TCs, for example (Figure 1), in 1998, when a strong El Nino event was developed, fewer TCs are formed in the WNP over the whole year; in the 2015-2016 El Nino event, TCs are more likely to recurve to north rather than straightforwardly head to west. The teleconnections of TC occurrence with ENSO phases can be simply described by the correlation coefficient map (Figure 3 top). Some meteorological services and agencies have included ENSO as one main source of predictability for the WNP TC activities in their seasonal forecast outlooks. Among these services are the GCACIC forecast at the City University of Hong Kong and the TSR forecast at the University College London. Before TC season started this year, they had forecasted that this year would be a normal or slightly above-normal year for the WNP TC occurrence. This is mainly due to the cold ENSO-neutral condition (Figure 1 bottom). In the meantime, the Met Office’s dynamical seasonal forecast model GloSea5 also predicts a normal or slightly below-normal season for the WNP TC occurrence (contact me if you want to see this result). It seems like that those seasonal forecasts did a reasonably good job for predicting the total number of TCs for the whole season. However, none of those forecasts, as far as I know, had predicted either an active early summer or a quiescent TC late summer for TCs as observed, even with a short forecast lead time. This means that the present seasonal forecast models (both statistical and dynamical) have less ability to predict the TC activities at sub-seasonal timescale (a time range between two weeks to two months). One of reasons for lack of such predictability might be due to the TC activities, which are ENSO-dependent in late summer, but are ENSO-independent in early summer (Figure 3 bottom). Even though the ENSO states are reasonably estimated, it does not necessarily mean that the most part of TC occurrence variability at sub-seasonal timescale can be well predicted. Here in Reading, the FASCINATE project, one of the Weather and Climate Science for Service Partnership (WCSSP) Southeast Asia projects funded by the Newton Fund (Nick Klingaman is the PI), is carrying out a detailed analysis of TC activities in the WNP. One aim of our project is to identify the sources of predictability for the WNP TCs, from synoptic to seasonal timescales, and evaluate the present forecast systems, such as the Met Office’s Numerical Weather Prediction and GloSea5, on the representations of such prediction sources. This entry was posted in Atmospheric circulation, Climate, Climate modelling, earth observation, ENSO, Equatorial waves, Historical climatology, Madden-Julian Oscillation (MJO), Numerical modelling, Seasonal forecasting, Tropical cyclones, Waves, Weather forecasting, Western North Pacific, Wind. Bookmark the permalink.